When my girls see rain outside, they grab their raincoats, boots, and umbrellas. To them, rainy days are meant for jumping in puddles, waddling like ducks, and collecting earthworms. We parents, teachers, and caregivers should confidently and enthusiastically encourage rainy-day play because it provides our kids with eight important benefits. Gross motor skills affect a child's balance, coordination, reaction time, and body awareness. Our kids develop these important skills as they jump, run, and play outdoors. Rainy days provide even more intense gross motor skill training, since our kids must balance carefully on slippery surfaces, work hard to walk through mud, and navigate the outdoors in their bulky rain boots. Our kids need to engage in active play every day. Play is important for their physical, emotional, and mental well-being. Even on rainy days, let's encourage our kids to go outside and run, jump, dance, and stay active. Rainy weather offers numerous opportunities for our kids to learn about science and record their findings in a nature notebook. For example, my girls might examine the effects of rain on materials like paper, chalk, and golf balls, predict how fast leaves and sticks will float down our sloped driveway, and hypothesize about the depth of mud puddles. And every summer, they track the amount of rain we receive and compare the total to previous years. I encourage these and other rainy-day experiments because I want my girls to stretch their creativity and reinforce science learning as they play. Water can produce electricity and cause flash floods. Rainy-day play gives me the opportunity to discuss the power of water and teach my girls to respect nature as we watch puddles widen along the road and see leaves float down the storm drain. Watch a water toy spin in a puddle. Identify the different sounds of hard and soft rain. Touch and compare rough earthworms, soggy ground, and hard rain boots. As toddlers, my girls sang "Row, Row, Row Your Boat" and "There's a Hole in the Bucket" when they danced in puddles. Now that they're older, though, they listen to the rain's rhythm and create their own songs. One of my girls usually starts clapping to the beat, and her sister improvises song lyrics. The rain sparks their creativity and invites them to make music. Rain supports life on earth, making it essential to our survival. Let's use rainstorms to help our kids gain an appreciation for water. We can talk about the water cycle, erosion, droughts, and floods as we build dams, fashion mud pies, and watch puddles form. I also challenge my girls to imagine what life would be like without the water that comes from rain. They sure would miss visiting the beach! 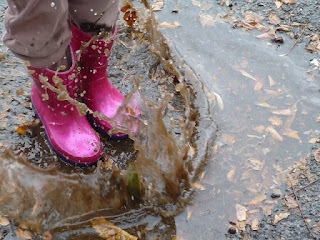 We depend on rain in so many ways, and playing outside on rainy days increases our respect for this valuable resource. Playing in the rain is good for my girls because they often cooperate as they dance, jump, and sing. I often join in the fun, too, because I value the opportunity to stay active and share bonding experiences with my girls. We still laugh about the time last summer when we danced in the rain all the way to the library. These memories are ones I know I'll cherish forever. The next time a rainstorm starts, bundle your kids up in the appropriate rain gear and head outside. Rainy-day play provides our kids with eight benefits, and it's fun. What educational, entertaining, and outdoor rainy-day activities do your kids enjoy? My girls would love to own a dog. Unfortunately, we're not able to adopt a pet right now. However, my kids can still get their fill of pet care as we help some of the 6.5 million homeless companion animals that enter animal shelters annually. As a family, we've discovered seven ways we can be animal champions in animal shelters and get our pet fix each week. Consider joining us! At our local animal shelter, my girls and I volunteer to cuddle cats, clean kennels, and stuff envelopes for fundraiser mailings. We work alongside other volunteers who walk, bathe, and groom pets. Together, we provide a better life for pets in the shelter and prepare our favorite furry friends to find their forever homes. Our local animal shelter often needs blankets, towels, and toys, and their website features a suggested donation list that usually includes cleaning supplies, laundry soap, and printer paper. In addition to adding at least one of these items to our regular shopping list, we often browse the animal shelter's Amazon wish list when we shop online. Every donation, whether it's large or small, makes a difference to animals in need. 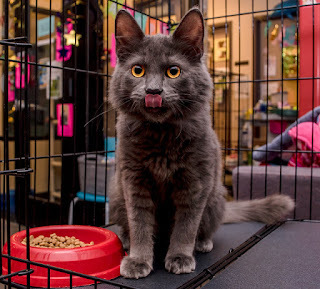 My older daughter likes to photograph pets at the shelter. 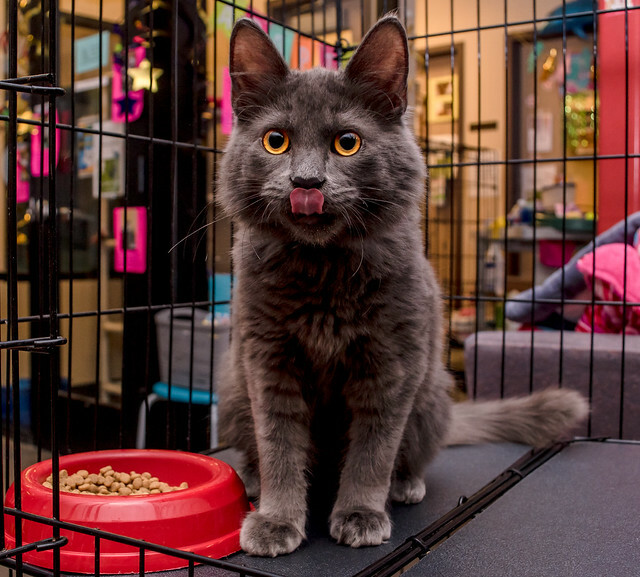 Some of her photos, posted on the shelter's website, have prompted successful adoptions! We also have friends who use skills like graphic design, bookkeeping, and obedience training to help shelter animals. I follow various rescue shelters on social media and often see requests for transportation help. The organization's members travel up to several hours away to rescue animals in need. Transportation volunteers also deliver foster or adopted pets to their new homes, take shelter animals to the veterinarian, or pick up donations each month from local businesses that participate in corporate fundraisers. With a vehicle and time, we can contribute to one of our favorite causes. Animal foster families nurture, train, and love homeless animals until these pets are adopted into a forever home. If your local shelter allows fostering, consider this opportunity. It gives kids exposure to pet ownership but is temporary, perfect for families like ours that can't commit to adopting a pet right now. Many animal shelters rely on financial donations. These contributions pay for veterinary care, spaying and neutering, medication, and daily operating expenses. For their birthdays this year, my girls set up a donation page for our local animal shelter. My kids appreciate the opportunity to give back to animals, and I'm grateful for the lessons they learn about selflessness, empathy, and compassion. Raising awareness about the pets that live in local animal shelters can promote adoptions. We follow our local shelter on social media and do animal networking with our social media contacts. We also tell as many people as possible about our volunteer work and encourage others to get involved, make donations, and help animals in every possible way. We may not be ready to adopt a pet right now, but we can help shelter animals in other ways. Whether you're an animal novice or expert, you and your kids could join us. In what other ways could we support shelter animals without adopting? As parents, caregivers, and teachers, we must teach our kids to value, respect, and preserve our planet. Earth Day, held annually on April 22, offers an excellent opportunity to have fun and become more eco-friendly. Here's a list of seven playful ways we can celebrate Earth Day this year. Appreciating nature is one of my family's favorite ways to celebrate Earth Day. Not only do we enjoy all of the beautiful sights of nature during our walk, but we also appreciate the opportunity to reconnect with the planet. We pick a local trail to explore, pack a picnic lunch, and plan a fun game. In past years, we've completed scavenger hunts, counted squirrels, and looked for objects in every color of the rainbow. This year, my girls want to illustrate our walk in their nature journal. One of our neighbors challenged us to park the car for Earth Day this year. He suggested we ride the bus or carpool unless we can bike, skate, or walk where we want to go. My girls are excited about this idea because it's an active, fun, and eco-friendly way to reduce pollution and protect our planet. Last year, my girls and I participated in a local tree-planting ceremony. This year, my girls decided to stick closer to home with their planting efforts and plan to fill our patio container garden with herbs and vegetables. My girls and I anticipate a tasty harvest and appreciate that the environmental benefits of growing food include reducing our carbon footprint. As part of our annual Earth Day celebration, my girls and I make an effort to reduce, reuse, and recycle. We evaluate our purchases over the past year and brainstorm ways to buy less stuff. We also look for ways to repurpose items we already own. For example, scarves can double as belts, and mugs can store pencils, makeup brushes, or silverware. Finally, we donate gently used, unwanted clothing, toys, and household items to charity. Each of these three actions benefits the environment and equips my girls with positive habits that support future conservation. Every April, my girls collect unusual items we might otherwise throw away, such as boxes, string, bread bag ties, and empty cans. They use these items to create unique works of art on Earth Day. This fun project exercises my girls' creativity and reduces the amount of trash we throw away. Even though our city officials prioritize trash removal, we always find litter on the ground as we walk around town. That's why we grab trash bags, put on gloves, and pick up trash on Earth Day. Our efforts spruce up our neighborhood and remove harmful litter that endangers wildlife, contaminates groundwater, and spreads disease. Many communities, including ours, host Earth Day events that raise awareness for our beautiful environment. In recent years, we've participated in a local wildflower planting ceremony, e-waste recycling demo, and park cleanup project. We enjoy attending these events where we learn new ways to protect our plant and celebrate Earth Day with our neighbors and community. 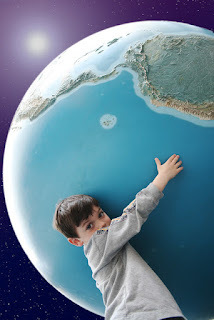 Earth Day provides parents, caregivers, and teachers with a unique opportunity to teach our kids to appreciate our planet and to establish eco-friendly habits. This year, consider participating in one of these seven activities. What other playful Earth Day activities do you recommend? Now that spring has arrived, my girls and I are officially in spring cleaning mode. We're cleaning the entire house from top to bottom and getting rid of clutter in each room. I'm especially excited about donating our unwanted kids' items to charity because we own too much stuff. To help my girls become more generous, protect the environment, and support a good cause, I ask them every year to research where we can donate our unwanted stuff. So far, my girls have recommended several places that will accept, use, and appreciate our gently used toys, clothing, and other children's items. Goodwill, Salvation Army, Community Aid, and Volunteers of America are four of many charitable organizations that resell donated items in their thrift stores. These organizations support employees with disabilities, feed the homeless, help at-risk youth, rescue pets, or meet other humanitarian needs in our community. Companies like Planet Aid accept used clothing and shoes via collection bins that are placed in store parking lots. Organizations use donated items to support environmental and social progress around the world. In addition to using collection bins, we've also donated shoes to Soles4Souls and winter coats to One Warm Coat, two organizations that serve people in need. In our local area, several homeless shelters provide temporary housing and support for families, including children, in need. I hate the thought of kids living in a homeless shelter, but I'm grateful that our like-new toys, clothing, and other items can give these kids a feeling of normalcy despite their challenging circumstances. After an accident, illness, house fire, severe storm, or other emergency, displaced families need a lot of support, including toys and clothing. My girls like to support Stuffed Animals for Emergencies because they know their gently used children's clothing, toys, books, and baby items will be loved and appreciated during hard times. Nonprofit nurseries and preschools typically operate on a limited budget and often appreciate donations of gently used children's items, including baby toys, books, and outdoor play toys. When we've donated to a nursery or preschool in the past, we usually ask if we can help out by reading to or playing with the children after we drop off our items. When my girls were younger, they always looked forward to visiting the doctor because of the toy and book section. Now, they get excited about donating toys to our local pediatric hospital and doctors' offices. Some of our local facilities only accept new items because of germ and infection risks, so we always call first and ask about their donation policy. We've met dozens of new friends through Freecycle. Members of this online group give or seek almost anything, making it the perfect way to purge our possessions and give kid-related items a new life in someone else's home. To ensure that our donations can be used by charities, we take several steps before we donate. Donate only new or gently used items. Wash clothing and toys thoroughly. Inspect items carefully, and throw away or recycle anything with missing pieces, holes, or other blemishes. Contact the charity to ensure that they can accept your specific donations. Review recalls and toss any unsafe items. As my family cleans our home each spring, we look forward to donating our gently used toys, clothing, and other children's items. Consider joining us this year as we support good causes, protect the environment, and teach our kids to become more generous. Where is your favorite place to donate children's items? Play is fun for kids, but it's also an important learning tool. While playing, my girls have learned skills like holding a pencil, waiting in line, and sharing their toys. Sociologist Mildred Parten Newhall agreed that play is essential for child development, and she discovered that children under five years of age engage in six stages of play. As parents, caregivers, and teachers, we should understand these stages as we help young children develop and grow. As babies, our kids spend most of their time sleeping, eating, and making dirty diapers. When they are awake, they move their legs, feet, arms, and hands in random ways or stare at a mobile above their crib or floor play mat. 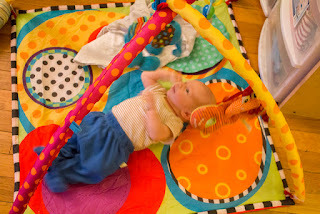 These actions seem insignificant, but they're a form of play that supports a baby's development. Through unoccupied play, babies discover how their bodies work and move, learn more about their surroundings, and prepare for future developmental stages. While observing children from birth to age two, we typically don't see them interact much with other kids. Their preference for solitude isn't because they're antisocial. Rather, kids at this age play alone because they simply don't notice other children who are sitting or playing nearby. 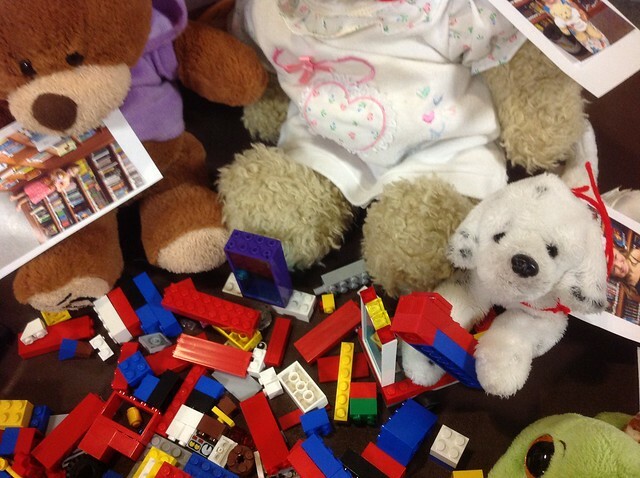 Solitary play is normal and developmentally important. Children discover their interests, explore their surroundings, and learn how to work independently as they play alone. Even now, my girls sometimes retreat to separate rooms where they can play alone and regroup, recharge, and rest. Around two years of age, children start to notice other children at play. While they're still not ready to join in or participate in the fun, they do watch closely from the sidelines. These kids may even ask the playing children questions about their game or activity. I used to think that my spectating girls were shy or hesitant. However, the onlooker stage of play teaches our kids more about how life works. They develop self-awareness, empathy, and nonverbal communication skills as they observe others play. Children start to play alongside or near other kids after they turn two years old. While kids in this play stage may not interact with, talk to, or share with their playmate, they do sit together and may even pay attention to each other. This stage of play lays the foundation for more complex play stages and social play activities our kids will explore later in life. I know my girls developed important motor skills, spacial awareness, and language through parallel play. Our kids begin interacting with each other around age three or four. This play stage normally doesn't include rules or organization. However, children may talk to each other, ask questions, and work toward a common goal during associative play. During this stage, kids may play with their own individual toys while sitting near each other on the floor. They may also swing and climb on the same piece of playground equipment or build a block tower together as they begin to understand how to get along with peers. When children play the same activity together, they're engaging in cooperative or social play. This stage of play normally begins at age four. Children may negotiate the game they'll play, take turns suggesting plots, and change roles as they cooperate to achieve a goal. Some of my girls' favorite social play included running a pretend restaurant, playing a game of tag, and completing a puzzle together. From birth to age five, our children experience six stages of play. Sometimes, they experience one or more stages simultaneously, and they may incorporate elements of earlier play stages as they engage in advanced play stages. The important thing is that we parents, caregivers, and teachers encourage our kids to play and provide plenty of play time as we help them develop and grow. What examples of these stages of play have you observed in your children?